Finding a sketchbook or journal with paper that will accept some watercolor washes AND with a beautiful cover can be tough. But it’s easy to personalize your journal cover with colors, symbols and words that are meaningful to you. In this post, I want to share a couple more that are particularly well-suited to spiral bound journals/sketchbooks. 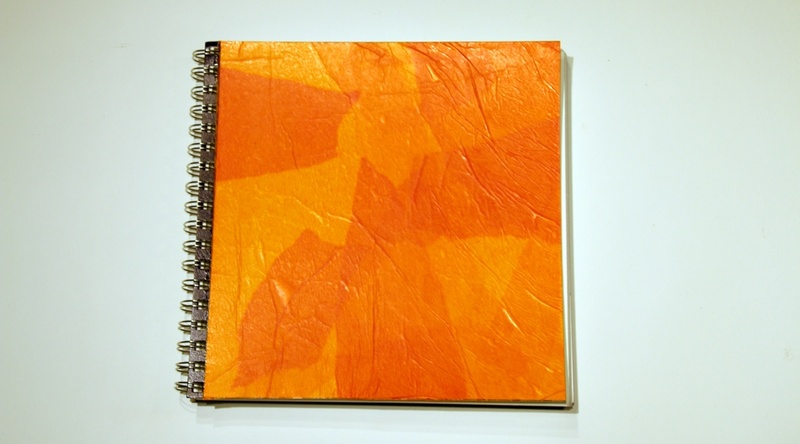 The layered tissue paper collage shown above can be done on hardbound journals as well. But first, I want to describe two ways to get a blank surface to work on if your sketchbook or journal has a printed cover. You can use them as a base for drawing, painting or gluing further embellishments of your choice, including the layered tissue collage, which I’ll describe at the end of this post. But many of them have covers printed with some sort of logo or advertising. The Bee Super Deluxe sketchbook has fabulous paper, but the cover is not particularly inspiring. In the earlier post on personalizing your cover, I showed you a way to stamp the cover with paint to get an interesting pattern. You can, of course, do that on a printed cover, too, but you’d probably want to start with a few coats of opaque paint first. If you have (or want to buy) some acrylic gesso, that’s probably the best base for further decoration. You can buy gesso online, at hobby stores like Michael’s, or in art supply stores. But you can also use leftover latex wall paint or spray paint. Light colors are generally more opaque and will take fewer coats to cover the printing. So even if you want your cover to end up, say, Chinese red or lime green, you might want to first paint it white or a light color and then paint over that with the color you want. TIP: To keep from accidentally gluing the cover to the first page or two along the edge, slip a piece of wax paper or freezer paper between the cover and the first page before painting. Other drawing tools may work, too. Best to test them by painting a scrap piece of paper and trying them out, as some things may not make a permanent enough mark on your painted surface. Of course, you can also glue things to the painted cover. If you used acrylic gesso, any white household or school glue should bond well. If you used up leftover house paint, it would be a good idea to test your glue on a sample first. A perfect way to get a blank surface on the cover is to tear out a sheet from inside the sketchbook, trim off the “jaggies” and glue the sheet to the cover. Tear out a page from the same sketchbook. A cutting mat and rotary cutter makes it easy to trim off the “jaggies”, but you can use scissors or an X-acto knife, too. Spread enough glue to completely cover the page. You can use a brush or a scrap of paper or cardboard to spread the glue on the back of the page. Starting at one edge, smooth the page down onto the cover. For the types of sketchbooks I’ve recommended, the paper should be heavy enough not to buckle if you work fairly quickly. Smooth out any air bubbles to get a good bond. After the glue dries, you may need to trim the paper slightly to fit the cover exactly. You may wish to weight the cover down for a while until the glue is completely dry. If so, place a sheet of waxed paper or freezer paper between the cover and the first page, and another between the cover and whatever you use as a weight (such as another book) to keep the cover from gluing itself to anything you didn’t want it to. Now you have a blank surface to decorate using ideas from the previous post on personalizing your cover, or your own ideas. This is one of my all-time favorites! It works with any sort of cover, but if the cover has printing on it, you’ll need less tissue if you first use one of the above two ideas to get a blank surface to work on. After you have a blank surface, all you need to do is tear up some ordinary tissue paper in colors that appeal to you, and glue it down, overlapping the pieces to make areas of mingled color. You can use white household glue, school glue, bookbinding glue or acrylic medium. Spread plenty of glue where you plan to put the first piece of tissue paper. Next, lay a piece of torn tissue down on the glue and spread more glue on top. Do not worry about wrinkles; they make an interesting texture in the finished cover. Just leave them. Now spread more glue and overlap another piece of torn tissue paper. You can use the same color or different colors. Keep gluing down overlapping pieces of tissue until you like the effect. You can work until you have just covered the entire surface, or you can add several layers. The tissue will become semi-transparent and underlying layers will show through. When you are pleased with the look, allow the cover to dry completely. Here, I have only worried about trimming pieces as I glued them along the spiral-bound edge, because I know I can easily trim the rest after the glue dries. Layered tissue paper collage over blank cover. I still don’t care for the bit of brown showing along the spiral-bound edge, so I’ll probably paint that at some point. You can also layer other things under or along with the tissue, such as leaves, lace, photos, or scraps of paper with bits of text. The glue makes the tissue semi-transparent, so whatever is layered under will show through. This is a great way to secure things that might be a bit fragile for gluing down without protection. If the cover curls a bit as the glue dries, that can usually be corrected by sandwiching it between layers of waxed paper or freezer and weighting it down with some books for a while. Even if the glue is dry, it’s a good idea to use the waxed paper or freezer paper. Sometimes white glues can stick to things you didn’t intend under enough pressure, even when they feel dry to the touch. Now, just add your own imagination! I’ve purposely given you mostly the how-to part of these ideas. My covers are usually decorated more than these samples, although often that happens gradually. Sometimes I don’t finish embellishing a cover until I’m retiring the journal! I hope you enjoy personalizing your journal cover and making it significant to you. And remember, if you’re feeling unsure about what you want, you can always use the kraft paper cover from the earlier post to give you a blank surface that’s removable if you change your mind. Many of you have made comments about needing to find or make time to journal. Believe me, I know exactly how you feel!In the next post, I’ll share some tips and ideas for successfully sustaining your creative energy journaling practice, even when you feel completely exhausted, stressed or overwhelmed. And why those are the times you may most need a practice just like this! Meanwhile, how will you personalize your journal cover? I’ve added the capability for you to add an image to your comments, so if you’d like to share what you’ve done so far with your journal cover, you can upload a picture here or on our Facebook page. On the other hand, please don’t feel any pressure to do so if you want to keep your process private and personal!